In October of 1998, Matthew Shepard, a young gay man, was brutally beaten, tortured, and left tied to a fence to die. He was discovered by a passing cyclist, who first thought Matthew was a scarecrow. Matthew was taken to the hospital in a coma and died six days later without waking up. It was a shattering event. At the trial, the murders attempted a “gay panic” defense, and other witnesses confirmed the role that hatred of gays played in the violence. Shortly after, New York City’s Tectonic Theater Company, under the direction of Moises Kaufman, traveled to Laramie to interview local residents and create a theatre piece which they dubbedThe Laramie Project. That piece has since been produced more than 2,000 times, often by drama students in high schools or colleges. It continues to spark controversy. Ten years later, in 2008, Kaufman and company returned to Laramie for a second set of interviews. The result wasThe Laramie Project: Ten Years Later, which receives its west coast premiere at the New Conservatory Theatre Center. The dramatic interest here is in what the townspeople have come to believe is the truth about the Matthew Shepard murder. Many now deny that it was a “homosexual hate crime” and insist it was primarily a drug deal gone bad. Some feel that the tragedy has been used by unscrupulous “gay activists” to push a personal agenda. Other town residents are gay activists. The police who investigated the crime were interviewed (they believe it was a hate crime). Although fascinating, moving, and stimulating, this material is more of historic than dramatic interest. It works well onstage, but is not really a conventional play. Kaufman has done an excellent job in sequencing the material to build interest in suspense. How, we wonder, did so many townspeople come to believe that this was not a hate crime? It is gradually revealed that a 20/20 TV news special put forth the theory that it was a drug deal gone bad. In one of the more dramatic moments, the police investigator of the original crime describes being interviewed by the 20/20 crew and how he feels he was lied to and manipulated. The evening builds to two dramatic jailhouse interviews with the young men who committed the heinous crime, Russell Henderson and Araron McKinley. Henderson. Ensemble members Alex Hero and Sal Maltos give extraordinary and unforgettable performances as Russell and Aaron, respectively. Directory Sara Staley and an excellent ensemble have done an extraordinary job with this important and moving material. Ron Gasparinetti’s functional set that evokes a rural fence to remind us of the scene of the crime and Christian Mejia’s typical outstanding light design serve the production extremely well. 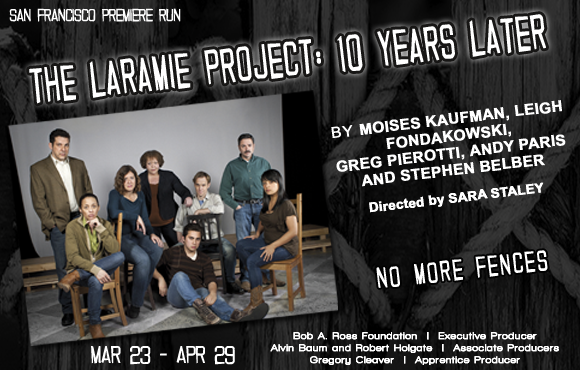 The Laramie Project: Ten Years Later continues at New Conservatory Theatre Center through April 29. For further information, click here. The Laramie Project: Ten Years Later, by Moises Kaufman, Leigh Fondakowski, Greg Pierotti, Andy Paris and Stephen Belber. Director: Sara Staley. Set: Ron Gasparinetti. Lighting: Christian Mejia. Costumes: Miriam Lewis. Sound: Ali Maggin. Posted in Reviews.Tagged Alex Hero, Ali Maggin, Chris Quintos, Christian Mejia, Diana Brown, Heidi Wolff, Miriam Lewis, Moises Kaufman, Natasha Noel, New Conservatory Theatre Center, Patrick Barresi, Ron Gasparinetti, Sal Mattos, Sara Staley, Tectonic Theater Company, The Laramie Project Ten Years Later, Timothy Beagley. Next Post Please write your state representative! This is important for theatre folk.